When phone bank worker Melissa Mendez, age 26, felt financially squeezed a few months ago—“I was short on cash and needed to pay rent”—she walked into a Cash 1 storefront in Sacramento and took out a payday loan. The annual interest rate: 460 percent. AB 3010: Authored in 2018 by Assemblywoman Monique Limón, D-Goleta, it sought to restrict people from taking out more than one payday loan at a time, and proposed creating a database requiring licensed lenders to record their loan transactions. Without the votes, Limón pulled the bill. AB 2953: Also authored by Limón in 2018, it aimed to stop lenders from charging more than 36 percent on auto-title loans, also known as pink-slip loans, but failed to secure enough votes to advance in the Senate. AB 2500: Authored in 2018 by Assemblyman Ash Kalra, D-San Jose, the bill aimed to cap interest rates at 36 percent for installment loans between $2,500 and $5,000. It died on the Assembly floor. SB 365: Authored by Sen. Alan Lowenthal, D-Long Beach, in 2011, the bill proposed creating a payday loan database, but it also languished. SB 515: This 2014 bill by Sen. Hannah-Beth Jackson, D-Santa Barbara, aimed to extend the minimum length of a payday loan and require lenders to offer installment plans, as well as develop a database and cap loans at four per year per borrower. It died in committee. 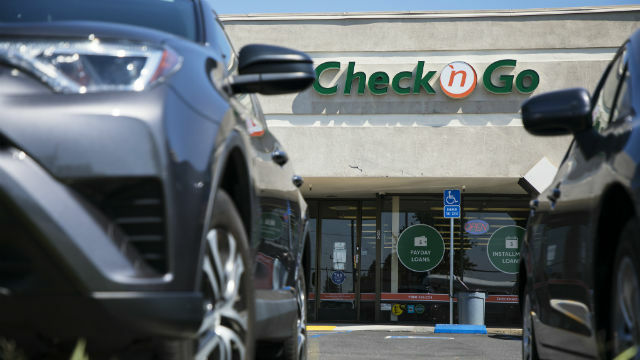 “(California) needs to innovate in order to bring in lower prices for consumers,” said Nick Bourke, director of consumer finance at Pew Charitable Trusts, which has studied predatory lending nationwide. The California Financial Service Providers Association, the industry group that opposed Kalra’s bill, argued that lowering rates would hurt their profit margins and cause them to throttle back on issuing loans—driving consumers into the hands of unregulated lenders and services. The association represents some of the largest payday lenders in the country, including Advance America. In California, consumers can take out a payday loan of up to $300—actually only worth $255 when you factor in a $45 fee—that in most cases must be repaid in full in two weeks. But a borrower who can’t make the full payment frequently takes out another loan to keep covering other ongoing costs—and the cycle escalates. In 2016, 83 percent of the 11.5 million payday loans were taken out by a repeat borrower, a practice known as loan stacking. The state says the average interest rate for payday loan transactions was 377 percent last year—a slight increase over what it was the previous year. Licensed lenders reported collecting $436.4 million in fees—70 percent of that from borrowers who took out seven or more loans that year. There are other options if borrowers need quick cash beyond the payday loan amount of $300—but they come with different risks.